MindGenius Ltd are pleased to announce that MindGenius 3 has been certified compatible with the recently launched Microsoft Windows 7. MindGenius had to satisfy tough certification criteria to carry the Microsoft endorsement and official logo. The certification process is made up of policies and technical requirements to help ensure that third-party applications carrying the Windows brand are both easy to install and reliable on PCs running Windows 7. These efforts include compatibility tests for ease-of-use, better performance, and enhanced security on PCs running Windows 7 software. For more information on compatibility with Windows 7, please contact info@mindgenius.com. MindGenius is excited to announce they have joined Twitter. Follow us at http://twitter.com/MindGenius and be the first to find out about special offers, webinars, customers stories and latest product releases. Marketing Manager Kelly Robertson said, "Our MindGenius customer base is very loyal and Twitter offers us an alternative way to keep in touch with them. We look forward to using Twitter, along with our own blog, blog.mindgenius.com, to communicate all of the latest MindGenius news." Strategic adviser Jayne Graham uses MindGenius mind mapping software to develop strategic business plans, gain clarity into high volumes of complex information and advise her consultancy customers, for whom she enables change, effectively. Jayne uses MindGenius to help with the development of strategies and to assimilate and analyse findings from research prior to reporting. For example through pulling together information from various sources from customers, through MindGenius, Jayne is able to develop clear plans for their future development, including goal setting (vision statements), clarifying their future purpose (mission statements) and developing strategic plans. Jayne uses MindGenius continually in her consultancy work. She says she always has several mind maps on the go, and for example, has used MindGenius to help with reporting the results of a complex piece of research to support the development of regional policy. As part of her work on behalf of clients she enables change for business and has developed new concepts and models in complex areas of business-related policy; supported businesses to develop new markets; and helped people who had a desire to get into business themselves to get started and realise their dreams. As well as mind maps, Jayne uses a range of Microsoft products including Groove (shared workspace), Project, and the usual office suite; as well as Skype for virtual meetings and SurveyMonkey to collect customer feedback. Jayne pulls together her ideas and information first, then steps back to look for a route forward which starts to emerge from the muddle. Jayne then re-orders the information to ultimately come up with a clear picture. She sometimes runs through mind-maps with customers, as it can help to them to get clarity, however most of the time the customer sees the end product – a clear route forward. “I think the economic climate is a difficult time to be in business, but it’s also a really good opportunity for businesses to stand back and think about where they’re going and how they’re going to get there. Bringing in a new perspective and some real objectivity can really help. That’s what 20:20 Consulting Ltd’s about – we’re about to go into our 6th year in business and our customers tell us that we’re here to stay! I have recommended MindGenius to many of my customers and associates because I get good results. The Ribbon User Interface may be unfamiliar to some of our existing V2 customers who have upgraded to Version 3 of MindGenius. The Ribbon User Interface was introduced to give key features and functionality more logical groupings, and to make it easier for users to appreciate and make use of the functionality contained within MindGenius. This style of interface is becoming more common in software applications, including those in the MS Office suite. The new Analyze Ribbon, for example, makes it easier for users to build on their understanding of a map and turn their collection of ideas into knowledge. First of all select a category group relevant to your exercise. Default groups exist for brainstorming, impact analysis, performance review, risk analysis, etc. If there are no suitable default groups, you can either rename the generic group or create your own category sets and add personalized icons. After you have selected which group/s to use, you can then go on to “drop” the categories onto your map to visually link ideas. Select the Category Dropper tool and then your relevant category and “drop” them onto relevant branches. Categories can also be added by highlighting the branch you would like to categorise then clicking on the relevant category. After you have categorised your map, you may want to look at the categorised ideas in a different way. Simply click “create category map” and a new affinity diagram map will be created with your ideas grouped logically by applied category. You also have the option here to export your categorised ideas to MS Excel for further analysis within pivot tables. So, to Analyze your ideas, every piece of functionality you will need is contained on the Analyze Ribbon which makes it easier and speeds up the time required to undertake Analysis. Similarly the Home Ribbon holds all required functionality around brainstorming your initial ideas, whether individually or as a group, and the Tasks Ribbon allows you to manage tasks, whether it’s managing to-do lists or full scale project management. If you are using the new ribbon user interface and have any questions on this, please contact us at info@mindgenius.comand we will be happy to help. MindGenius 3 for Education has now been released and is available for general download and purchase. With a host of new features to make working with your information and in class even more effective, MindGenius 3 significantly improves collaborative learning, brainstorming, class presentations, study, problem solving, and task management capabilities. New Features include a Ribbon User Interface which allows for easier access to the most commonly used features and functionality. This logical grouping of key features and functionality makes it even simpler for students to use and complete tasks within MindGenius. MindGenius 3 also offers the ability to add and edit your own question sets in the Question Tool allowing you to create frameworks for lesson plans, or to set questions for students to answer when undertaking essays or presentations. Other new functionality includes an updated image library and improved functionality around formatting a map to add colours and imagery, which can help aid the look of presentations and memory recall for study; improved Analysis capability to help you sort and filter your ideas for use in classroom problem solving, University projects and dissertations; and an MS Excel export for use with pivot table analysis, and task management, allowing you to work with numerical values as well as words. MindGenius education is available to existing users for upgrade for just £29/€33/$46 (& VAT). Multiple user discounts, including those for site licenses are available, please contact sales@mindgenius.com for more information. MindGenius 3 was released 2 weeks ago and since then we have received some great feedback on new features and functionality within Version 3. Giles Massingham, District Manager UK, Bang & Olufsen Retail said: "MindGenius has always given me the ability to capture my ideas or customer requirements, then organise, understand and prioritize them quickly. After this, I can go on and share the map with colleagues or customers, or undertake the resulting actions. MindGenius 3 makes this process even more streamlined and effective. My job is extremely demanding and MindGenius 3 makes it so easy to handle my ideas and plans that I genuinely don't know what I would do without it." New features in Version 3 include an updated Ribbon User Interface which helps improve functionality around analysis, task management, brainstorming, exporting and presentations. It groups together key functionality for undertaking these activities, making undertaking them even more streamlined. 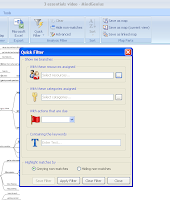 The new export to Excel functionality seems to have struck a chord with many users excited about the possibilities this functionality offers around task management and numerical analysis of data. A full list of new features and functionality is available at http://www.mindgenius.com/upgrade.aspx. For those of you who haven’t upgraded yet, MindGenius 3 is available at a special price of £88 /€ 101/$ 141 until December 31st 2009 to MindGenius Version 2 users. And remember, this special price still allows you to license the software on 2 Personal Computers, e.g. business PC & home PC or business PC & laptop PC. The software can only be run on one PC system at any time. This is not valid on the Academic version of MindGenius. Why not download the 30-day trial now, you do not need to uninstall MindGenius V2 as both versions will run side by side. If you are new to MindGenius, MindGenius 3 is available to purchase for just £147 /€ 169/$ 221, per single user licence (allows installation on 2 machines). All prices are exclusive of VAT. Academic user? MindGenius Education 3 is now available. Please visit http://www.mindgenius.com/academic-upgrade.aspx to find out more.